(Phys.org) —A multi-university team of engineers has developed what could be a promising solution for charging smartphone batteries on the go—without the need for an electrical cord. Incorporated directly into a cell phone housing, the team's nanogenerator could harvest and convert vibration energy from a surface, such as the passenger seat of a moving vehicle, into power for the phone. "We believe this development could be a new solution for creating self-charged personal electronics," says Xudong Wang, an assistant professor of materials science and engineering at the University of Wisconsin-Madison. Wang, his Ph.D. student Yanchao Mao and collaborators from Sun Yat-sen University in China, and the University of Minnesota Duluth described their device, a mesoporous piezoelectric nanogenerator, in the January 27, 2014, issue of the journal Advanced Energy Materials. The nanogenerator takes advantage of a common piezoelectric polymer material called polyvinylidene fluoride, or PVDF. Piezoelectric materials can generate electricity from a mechanical force; conversely, they also can generate a mechanical strain from an applied electrical field. Rather than relying on a strain or an electrical field, the researchers incorporated zinc oxide nanoparticles into a PVDF thin film to trigger formation of the piezoelectric phase that enables it to harvest vibration energy. Then, they etched the nanoparticles off the film; the resulting interconnected pores—called "mesopores" because of their size—cause the otherwise stiff material to behave somewhat like a sponge. That sponge-like material is key to harvesting vibration energy. "The softer the material, the more sensitive it is to small vibrations," says Wang. The nanogenerator itself includes thin electrode sheets on the front and back of the mesoporous polymer film, and the researchers can attach this soft, flexible film seamlessly to flat, rough or curvy surfaces, including human skin. In the case of a cell phone, it uses the phone's own weight to enhance its displacement and amplify its electrical output. 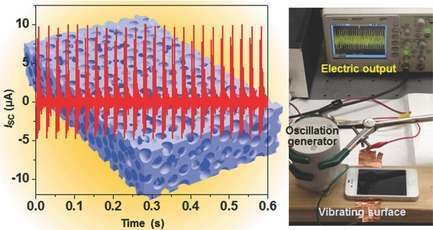 The nanogenerator could become an integrated part of an electronic device—for example, as its back panel or housing—and automatically harvest energy from ambient vibrations to power the device directly. Wang says the simplicity of his team's design and fabrication process could scale well to larger manufacturing settings. "We can create tunable mechanical properties in the film," he says. "And also important is the design of the device. Because we can realize this structure, phone-powering cases or self-powered sensor systems might become possible." I saw PVDF as a means to building greener and smarter electric grids and skyscrapers in 2010 as they do tend to wobble over time. I'd like to know if anyone is playing with optical radiation pressure capture and lensing to run a soliton PBG/Klystron closed loop for renewable energy capture, computation and dissipation as required. If the PBG or Klystron holds a greater capacitance than the soliton generator the continuous power the device requires as idled would be lower and near ideal as initialized; the exception would be if this system were placed under vacuum with no optical radiation sources near enough to affect the constant potential required, the initial charge would likely be once a lifetime of the product. I wonder, if you apply voltage to the terminals of this nano-generator, do you get vibration? Piezoelectric materials can generate electricity from a mechanical force; conversely, they also can generate a mechanical strain from an applied electrical field.